Rage is only one small part of anger. Are you an angry person without even knowing it? I do not shout... so I cannot be angry! Because there is misunderstanding, stigma, fear and denunciation attached to the word anger it has, for some become a taboo, offensive or an unmentionable subject. Many people reject that they could be angry. For some people anger does not fit with how they see themselves. Sometimes irritable, frustrated, moody… yes possibly. Angry?… no never. Do any of these words correspond with how you feel sometimes? All of the above could be how anger exists within you. A subtle subconscious denial and distortion of what is really happening inside you may be camouflaging your anger, and yet anger issues may be stealing your life away. Many people live for years with anger hidden inside them; anger unwittingly controls them – below their awareness. They live rejecting a buried truth – they refute that they are angry. They get their heads down and plough on being internally angry, irritable - knotted up with a dull dissatisfaction deep within. They feel awkward with people, or frustrated or suspicious or all of these simultaneously, but alway clandestinely… secretly on the inside...their feelings kept to themselves. Be absolutely honest and take a moment to consider your own situation, do you deny, distort and suppress your irritation, frustration and annoyance? 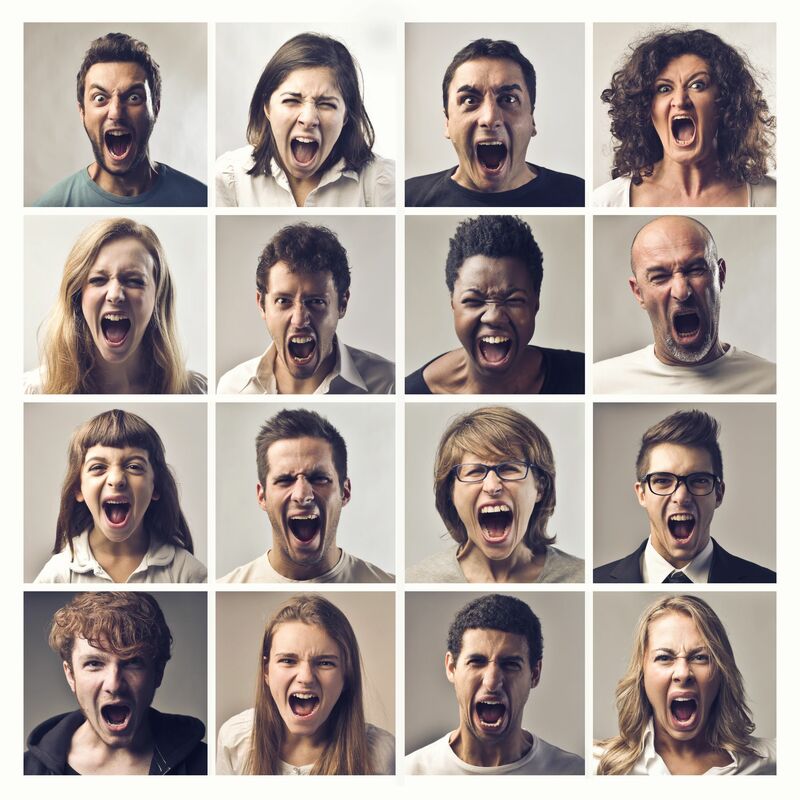 With you there may be no red face; no grimacing, no verbal outburst and certainly no physical element to how you feel… so are you an internally irritable and frustrated type of angry person? With the great majority of angry people anger is, most of the time hidden… neatly squashed down… out of view. So what is this 'non angry anger' like? Some, despite what they would like to think about themselves and have their friends say about them, often do categorise and scorn, judge and deride. This is a form of anger. And then there are those meta-perceptions, where so much time is wasted contemplating and reacting to all of those things others might be thinking, might be saying or might be doing - all this is priming their personal irritation and tension triggers. Then there is the iceberg (more is hidden than is visible) irritation syndrome, where subconsciously this fluctuating and frustrating disorientation, heaves around in your stomach. You can feel it, whilst not knowing why it's there or where it comes from. It's painful, but still you feel it needs to be contained. We all have a unique self-defence mechanism and some use rules to stabilize themselves defensively, so they can't be caught off guard. These rules usually suggest that is only one correct way; a right way and all other ways are wrong. There is a clear definition between good and bad. This stuckness creates confusing limitations and restricts expression and gives internal hurt. These examples are all personal forms of anger, however well disguised. Often this cloaked irritation and frustration can fester within, offering the occasional wrenching sensation that often hollows people out, sometimes having an isolating and kind of sorrowful effect upon them. That's OK then. Most of the time it is just this horrible ache inside. Easy to keep hidden, and yet tough to ignore. Amazingly people live with this and even more incredibly they genuinely do not realise that others live differently. It is not apparent that others have a richer, calmer and possibly better life. Some 'non-angry angry' people just assume that what they experience is normal (if such a paradigm exists). Normal is safe. The first truth is that many people are perhaps unaware of how others think and feel. The second surprising and more painful truth may be that that many people are unaware of how they themselves think and feel. Anger is not just rage, or shouting or punching or throwing things. I believe being angry is different for everyone, but most of the time it is internal and not external. This 'non-rage' anger pain sits within millions of people. It agitates them to the extent that they cannot unwind at home or concentrate at work. It means their lives operate at a much lower and less satisfying level than could be possible. This is not external rage, but it is internal anger.